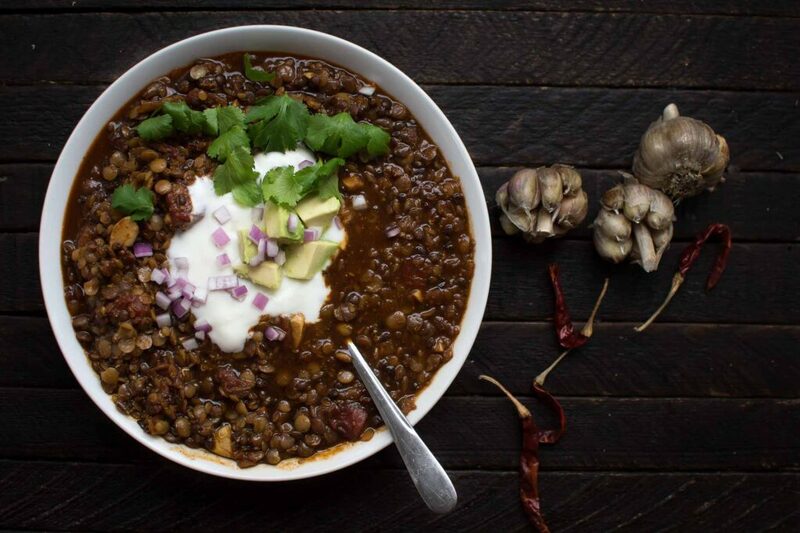 Lighter than a traditional beef chili, this Sprouted Lentil Chili combines sprouted lentils with fragrant cumin, hot chiles, slow-simmered tomatoes, caramelized onions and plenty of garlic. A variety of lentils contributes to varied texture. The gelatin in broth, while not a complete protein in and of itself, helps to extend the protein in other foods making it a perfect partner for protein-rich lentils. 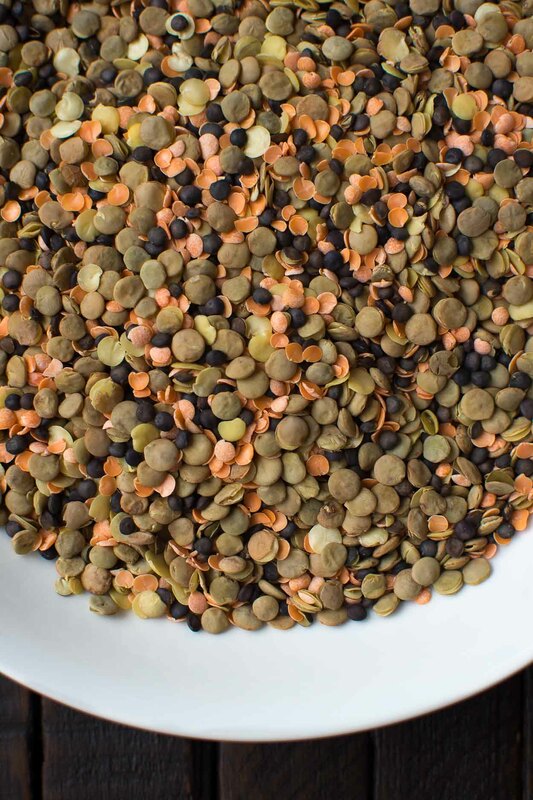 Lentils are also particularly rich in micronutrients like phosphorus, potassium and iron. While lentils, like all pulses, are a good source of resistant starch and minerals, sprouting does two things: First, sprouting enhances the bioavailability of minerals that lentils contain, making them easier for your body to absorb them, and, secondly, sprouting actually increases key nutrients and antioxidants like vitamin C. In essence, sprouting captures that fragile transformation from seed to plant, giving you the nutrients of both in one shot. 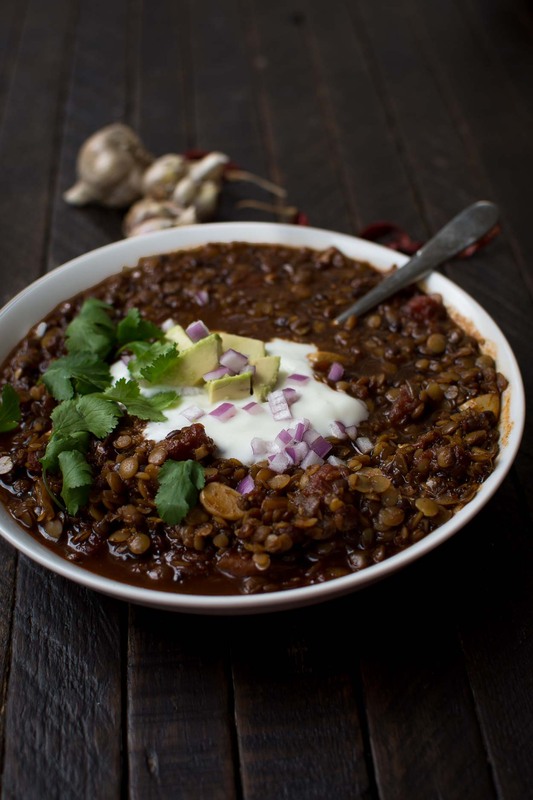 Enriched with cumin, fragrant onions and slowly simmered tomatoes, this Sprouted Lentil Chili pairs beautifully with sour cream, avocado and freshly chopped cilantro. This recipe was developed in partnership with TruRoots, using their Sprouted Lentil Trio. Warm the olive oil over medium-high heat in a Dutch oven or heavy stock pot. Toss in the chopped onion and garlic, sauteing until fragrant and translucent, about 3 minutes. Turn down the heat to medium-low, and continue cooking the onions and garlic in the hot oil until they begin to caramelize around their edges - about ten minutes further. Stir in the salt and spices, and continue cooking a minute or two longer. Stir in the lentils and tomatoes, and then pour in the broth and simmer, over medium heat, until the lentils are softened and cooked through - about 15 minutes. You can sprout your own lentils, which takes a few days, but you can also pick up sprouted lentils from any well-stocked natural foods stores (and online). We used TruRoots Sprouted Lentil Trio in this recipe which combines three types of lentils, giving anything you make with it a nice and variable texture. Lentils are rich in resistant starch, protein and minerals, and make for particularly easy, filling and inexpensive meals. You can check out all our lentil recipes here. Lentil Stew with Winter Vegetables and Mustard Greens is beautiful drizzled with olive oil and balsamic vinegar. Curried Lentil Soup with Coconut Milk is delicately spiced with coriander, cumin and ginger. Smoky Sprouted Lentil Soup is a great cold-weather recipe, and includes chicken, mushrooms, andouille sausage and fresh thyme. 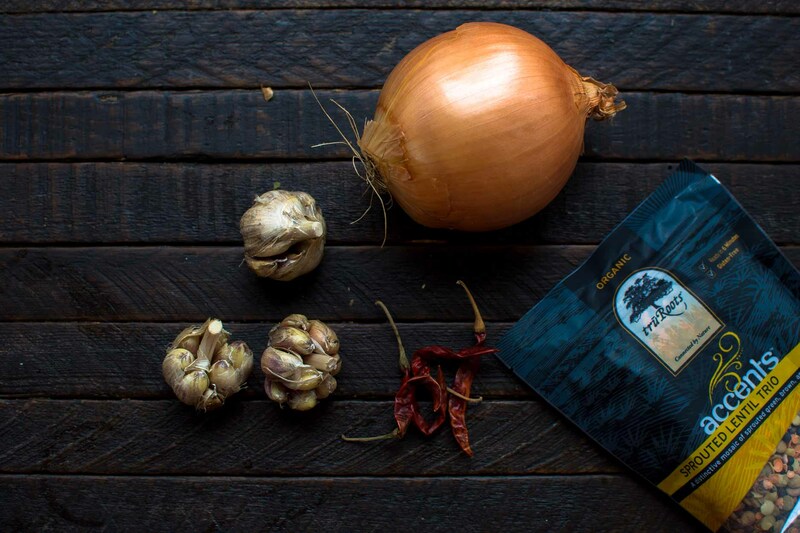 We love chili in our household; I can’t wait to give this recipe a try. I love how easy this recipe was. I only made a couple minor tweaks to the spices, since I’m not a huge fan of spicy, and substituted paprika for the chili powder, skipped the red pepper flakes, and subbed black pepper for the cayenne. (These are subsitutions I make for any recipe I think might be too spicy for my liking). The balance of flavors was great (even as I asked myself as I was making it – that much of this spice?). It tasted just how I expect chili to taste (in other words, very good) and the lentils were nice and “meaty.” I’m definitely putting this one in my recipe file to make again (and again). I sprouted my own lentils at home, and added only 4 cups of beef broth. It turned out way too watery! The flavour is good though, but It’s been simmering for over an hour to try to get rid of some of the liquid.